The New York Times film critic shows why we need criticism now more than ever. ...[a] lively, often impassioned, occasionally breezy defense of a profession that many see as headed to extinction ... acute exegeses stand in reproachful contrast to the occasionally lumpy quality of the book’s capsule surveys of intellectual history; like many a survey course, this one can feel at once cursory and undigested. Mr. Scott turns his defense of the profession into an 'apologia pro vita sua,' psychoanalyzing himself for his benefit as well as ours ... The critic critiques and criticizes himself. And he acknowledges, too, that 'there is, axiomatically, no disputing taste, and also no accounting for it.' Criticism in its fullest form—analysis and discrimination—is always work. The sections of the book styled as dialogues – in which conflicting versions of the author tussle with each other – read clunkily. But if there is nothing here as amusing as David Lee Roth’s quip – 'Most music critics love Elvis Costello, because most music critics look like Elvis Costello' – Scott is still an amiable guide through some of the key historical, philosophical and practical issues concerning criticism. 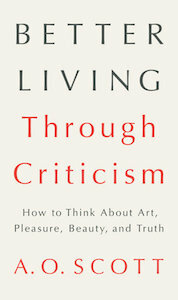 What did you think of Better Living Through Criticism: How to Think about Art, Pleasure, Beauty, and Truth?